At a bridal shower, I once heard the story of a young newlywed couple who were working intentionally on their marriage and good communication and loving each other well. They made the arrangement that they would greet each other at the door every day when the husband arrived home from work. If he had had a particularly challenging day at work, was not in a good mood and needed some extra space, understanding and TLC he would turn his hat (that he always wore) backwards. That way the wife knew to give him some extra grace, care and to take on more of the evening household duties. And vice versa, if the wife had had a particularly stressful day and needed extra measures of understanding, grace and TLC she would pin her apron up. This way the husband could take over making dinner, make an extra effort to listen and whatever else was needed. This was a great arrangement until the day when the husband arrived home with his hat backwards and met his wife at the door with her apron pinned up. I don’t know about you, but when special needs entered our worlds, every day my apron would have been pinned up had we had this arrangement. Of course, no apron was needed…I wasn’t at the door to greet him. Dinner was not yet in the works, or if it was, it had only gotten as far as some chopped veggies on the counter with no further plan. Crying (our son’s) often could have been heard before he ever arrived at the front door or at least as soon as he opened it. Welcome home, Dear. If his hat was backwards, I wouldn’t have noticed. These men of ours. These special needs dads. They are a special lot. They keep showing up. As men, they have the desire to fix it and make it better, but they can’t. Not for the child, not for their wife, not for the other kids. Some dads (and moms) don’t stick it out. They say, “I didn’t sign up for this” and they are gone. If that’s your family’s story, I’m sorry. I’m sorry for your pain, loss and that you are alone to handle all the pressures now. If your husband is faithfully showing up, I encourage you to take a minute or two to express your appreciation for who he is and all he does. It can be spoken or written. If you write it, he may tuck it away to read repeatedly, especially during times when he needs a reminder that he is valued. It doesn’t have to be ornate or long. If you have time and energy for a long letter, wonderful. But, short and sweet, even one line, can work just as well. Proverbs 14:1 says, “A wise woman builds her home, but a foolish woman tears it down with her own hands.” I’ve seen women who criticize, put their husbands down or tell him what he is currently doing or providing isn’t enough. These women are tearing down their homes with their own hands. I’ve also seen women who build their husbands up speaking into their souls words that encourage and empower. 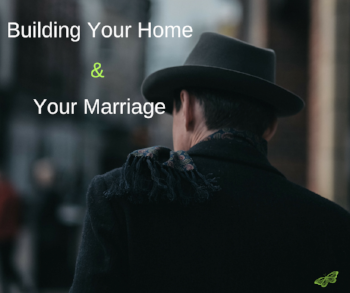 What can you do today to help build your home and your husband?